I searched the forest for the yellow strips of plastic we had tied around the maple trees. The cold wind slipped in and out of the oaks and the yellow buckeyes and the dead cedars blight had killed years before – they stood there, silver sentinels, spooky and branchless. When we cut them their insides were an orange-red, and they smelled like memories. The spring was coming, or so everyone said, and I was trying to catch spring as it ran up the maple trees. I carried my drill to the first piece of yellow tape and pushed it in, forming a hole. 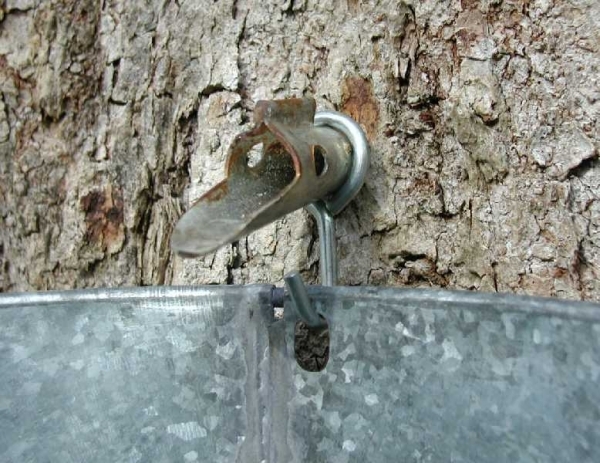 I tapped the spile into the tree trunk with a rubber mallet and hung the silver pail on the hook, imagining the sound the sap would make when it ran. The sound of spring on the way. The sound of hope. I sit in a hotel room in Maryland. My dad sleeps in the neighboring bed – my son is beside me. Every year we come here to Frederick, Maryland, and every year it goes more or less the same. Every year we see mostly the same people, do the same things, set up on the same day, tear down on the same day. But it’s never exactly the same – every year we are, all of us, one year older. It’s easy to forget that. It’s easy to forget that time has passed. But time does pass, slow, methodical, like the dripping of sap into a stainless steel bucket. Time. Friends convinced me to try to sell my novel to a publisher, so contacts were made. Emails sent. Proposals written. And now the waiting. The wandering through trees of a nearly-spring idea; the cold wind that rustles thought; the forgotten melancholy that only hope can cause. Hope is a wonderful thing during the early phases, when everything is motion and planning. The movement, the concrete nature of expectation, gives a kind of certainty to hope, a sense that “but of course it will all happen the way I want it to.” But as time passes and hope slips out ahead of you, disappears among the trees and you have to wait for it to come back, that is when winter seems the longest. That is when it seems like the sap will never run. How can we keep hoping, those of us who have walked this road so many times? What will bring us back to the trees for the fifteenth time, the twentieith time, to check if the sap has run? It’s the knowledge that once you’ve identified the trees, and tapped in the spiles, and hung the buckets, and walked back through the cold forest, at some point the sap will run. The sap always runs, eventually. …..and the potential for something sweet! Love this! The sap always comes. Good words for those who are waiting and hoping.